Posted April 16, 2005 by Emmet Farrell in News. Progressive Democrats TD Noel Grealish has challenged Fianna Fail Ministers Eamon O Cúiv and Frank Fahy to bring the Taoiseach to Galway to see first-hand the urgent need for a bypass for the village of Claregalway. ‘I have brought both the Tánaiste Mary Harney TD and the Minister for Justice Michael McDowell TD to Galway in recent weeks to meet with the Claregalway Bypass Action Group and witness first-hand the awful traffic congestion in the village,’ says Grealish. ‘Claregalway residents were very pleased that both the Tánaiste and the Minister for Justice agreed to meet with them, and were encouraged by their support,’ according to Deputy Grealish. 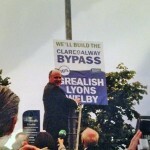 The Claregalway Bypass Action Group met with two senior Government Ministers recently. On Thursday 24 March, the Tánaiste Mary Harvey visited Claregalway with Noel Grealish TD and experienced the afternoon traffic congestion which is the norm every day in Claregalway in recent years. 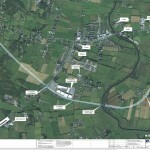 During a meeting with the Claregalway Bypass Action Group, the Tánaiste agreed to recommend to the NRA that a bypass should be built as soon as possible to alleviate the traffic problem. Mr. Michael McDowell, TD, Minister for Justice, Equality and Law Reform, met the Action Group with Noel Grealish TD on Wednesday 2 April and confirmed that he too would recommend to the NRA that work should commence on a bypass as soon as possible. Letters of support have been received recently from Mr. Seán Ó Neachtain, MEP and Mr. Jim Higgins, MEP. Mr. Higgins lives in Ballyhaunis and travels through the congested village regularly en route to Galway. Latest official figures show that there are 29,000 vehicle movements seven days a week through the village. Delays of over 30 minutes twice daily are the norm during peak hours. No other town or village in Ireland has a traffic problem of this magnitude. With a population third in size after Dublin and Cork, Galway is 10th on the NRA’s spending per county to date. Galway Co. Council Roads Department is actively pursuing the bypass and is in consultation with the NRA, identifying a route and designing the road. 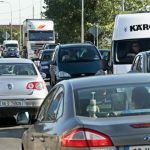 The Action Group is calling on Galway’s Ministers to make public their support for the Claregalway community as well as the thousands of commuters delayed in traffic congestion daily. Government support and NRA funding to reduce the continued waste of resources is essential. With the one-year anniversary of the “smoking ban” on March 29th having just passed, there has never been a better time to quit smoking. Smoking is the greatest single preventable cause of premature death. In Ireland 6,ooo people die every year from tobacco related diseases. The Irish Cancer Society in partnership with the Department of Health and Children operate the National Smokers’ quitline, which is staffed by trained smoking cessation counsellors. Call Save 1850 201 203 is open 8am to 10pm, Monday to Sunday. Nicotine Replacement Therapy (NRT) replaces the nicotine that the body misses when quitting, there are a variety of NRT products available to suit different types of smoker. There are patches releasing nicotine over 16 or 24-hour periods, gum, lozenges, microtabs and inhalers. NRT is available free to medical cardholders on foot of a prescription from their doctor or available over the counter from pharmacists. Prepare to quit- weigh up the pros and cons, write down reasons for quitting. Make a date to quit. Support- ask family and friends to help you quit. Change your routine- if you have activities you associate with smoking, change these. Think positive- you may have withdrawal symptoms; these are positive signs the body is recovering. Save money- put the extra cash towards a holiday or a reward for quitting. Take one day at time. Dealing with cravings, practice the four Ds, delay at least 3-5 minutes and the urge will pass, drink a glass of water, distract yourself- move away from the situation, deep breathe – breathe slowly and deeply. Claregalway Pharmacy is open late Monday to Friday until 8pm. John Duffy MPSI. sited at Claregalway as part of the East Galway Art Program, a work by Robert McColgan. Six projects were nominated for the East Galway Art Program. Site(s) visits in each area were organised for the artists by the County Galway Arts Office. Transport, food and compansionship were supported by information and contacts for each place: History, Sociology, Geology etc. Artists were encouraged to submit for as many projects as possible. I put in ideas for four. The site(s) at Claregalway can be treated as two, divided by the road, or as one, joined by it. Open ad exposed both visually and to the elements, the whole is 80 meters long with an average width of 10 meters. This location was interesting because it made demands that suited the direction my work had been taking: large scale and site specific. Positioned at the entrance to the town, here was an opportunity to make a major “gateway” work”. It was immediately apparent that a work of considerable scale and extension would be required, be it in one or two or more parts. I drew up many ideas, always attempting to “connect” the two parts of the site. This resolved itself through the arch concept which was suggested by the historical links with stone arches in the area. An arch of welcome began to become the solution. The use of modern materials would act as a foil to the existing arches while celebrating the dawn of the new Millennium and the extraordinarily positive transformations taking place in Ireland and Claregalway today. One sees innovation and confidence everywhere. The work should connect locally, symbolise Community and achieve iconic status as a symbol for Claregalway and the area. The sculpture needs to function in support of local initiative and activity. The quarter circle, at the left, in plan forms the cup of a hand, symbolising Closeness and Community and relates in scale to people of all ages. This element of the work is suitable for centering performance events of all kinds which on festive and celebratory occasions would bring vibrancy and life to the site. The sculpture would need to be simple and memorable. The scale and unity of the piece makes it easy to recall and associate with Claregalway. Robert McColgan is a long established artist with a background in 2D and 3D Media, Dance, Performance and Community Arts. He has been working in the Public Arts arena for the past decade. He has represented Ireland abroad and to date has completed many large scale projects. He is a holder of the Medalha Municipal from Caldas da Rainha in Portugal. Founder of the Art Day concept in 1985 at the Bray School Project, a movement which is now widespread throughout Ireland, he continues his involvement with Community Arts in his sculpture and at the Glasnevin Educate Together National School. His work in Education takes him all over Ireland and is focused on opening up new opportunities and strands at every level. He is a Senior Lecturer in Fine Art, Painting and Sculpture at the Dublin Institute of Technology wich is supportive of art practice as an important research element within the teaching/learning domain. The “Arch” project is the main focus of Roberts work at this time and is, he says “proving to be a challenging but satisfying opportunity”. Two million pilgrims spread across Rome, including several hundred thousand around St. Peter’s Square. Twenty-seven giant TV screens in streets and plazas near the Vatican and gathering points. More than 15,00 soldiers and police patrol Rome. 3,500 temporary toilet blocks near St. Peter’s and the TV screen areas. 3,500 Vatican-accredited journalists cover the event. My memories of Pope John Paul’s visit to Ireland are very vivid. Our wedding day was planned for the 29th of September 1979 – the day the Pope was due to arrive in Galway. Needless to say, the wedding was brought forward but my memories of his visit are lucid. His image was everywhere. He had a presence, a stance and he touched many people. He was not afraid to express his opinion. “Subito Santo” Canonise Him was a chant from the thousands of pilgrims who attended his funeral and I feel this will happen in time. He touched so many lives – he was a Saint. Fresh early potatoes with that new potato taste are a welcome sight in mid July; sow your certified seed potatoes now for an early crop. Traditionally early seed potatoes were planted in large drifts in neat ridges spanning the entire length of the larger garden. Gardeners are now more interested in growing a smaller quantity of vegetables but more variety covering a longer cropping time from early summer to late winter. Potatoes can be growing even in the smallest section of soil, sprout early seed potatoes now indoors in a bright frost free location for planting out next month. Look for the tried and tested varieties including home guard, duke of York, epicures, sharp’s express, and those popular second early British queens. Remember to add growmore to the soil before planting. Garden herbs are one of the easiest garden plants to grow, suitable for all gardens, and many varieties suitable for growing in patio pots and containers. Cutting your own fresh herbs can be so easy if you plant now. Young fresh herb plants are now available for planting in flower borders to complement existing plants or in containers kept close to the kitchen for easy access. Use the most popular herbs in containers and window boxes and keep outdoors close to the kitchen many varieties are winter hardy and will survive all year round with out protection. Remember that now is also the best time to plant tasty herbs – pick popular varieties like Parsley, chives, oregano, thyme, basil and dill – simply pot them up into tubs or containers and grow them on your patio or window sill outdoors. Garden herbs are so easy to grow and so prolific. April is also a great time to plant garlic and vegetable onions – plant sets and shallots now into soil where growmore has been added. April is the ideal time to pot up some summer flowering Dahlias – remember dahlias flower from early summer to mid winter and are so easy to grow. Dahlias can be simply potted up into pots in Nursery stock compost – placed indoors for about four weeks to sprout and planted out of doors in their flowering position. Moss is a major problem this spring in many gardens – on your lawn kill lawns moss with a light application of sulphate of Iron on Patios, slats and wall areas kill moss with Armillatox. Apply them now. For colour in May – now is the time to plant Turbo pansies, double daisies, ranunculus and the beautiful mixed coloured violas. They are all-ideal for borders or containers and are very hardy. Plant scent and colour in your garden with the beautiful summer flowering Sweet peas – remember to add some garden compost of Farmyard manure to the soil before planting. Plant some veg and herb plants now – Cabbage, cauliflower, lettuce, sprouts and the full range of fresh garden herbs are now available. My advice is to plant little and often as we at Horkans will have fresh veg and herb plants all season ready for planting. For weed free potato drills apply a dressing of linuron weedkiller to the newly plant potato drills – linuron prevents weeds from growing on the drills and will not effect the developing potato stalks. Now is the ideal time to pot up tomato plants into large pots with Westland compost and place then into a bright frost-free location for great fruit this summer. April is a great month to plant shelter in the garden – consider planting a hedge of laurel, escallonia, privet or griselinia now and avail of the great growing conditions for the next six months. Keep in touch during the week with our gardening on the web. If you are lucky to have access to the web then click onto our very own Gardening web site www.gardencentre.ie you can review our latest gardening advise and tips. My thanks to Mike Perry for his help on this. The lovely Devon Pinks have just come into flower – Devon pinks flower each year from late spring to late summer. The silver foliage forms a compact border plant and produces large double scented flowers all summer. This is a plant to plant in a sunny border or container in groups of threes for long-lasting colour this and every summer. Look out for the following three varieties. ” Sunflower Champ ” has lovely double rich red flowers with a super scent. ” Diane ” produces brilliant white double blooms again with a heaven scent and ” Diogenes” produces a lovely double pink bloom to brighten any garden. Fuchsia will reward you with lots of long lasting summer colour. April is the ideal time to plant fuchsias in your garden for pots and containers I recommend Fuchsia princess with its beautiful rich double blooms, another great upright variety is Fuchsia Beacon which produces rich double red and pink blooms all summer – perfect in tubs or borders. For your basket look for the brilliant Fuchsia Monk – it trails beautifully out of hanging baskets or containers and is so easy to grow. Plant turbo pansies now for long-lasting colour. Turbo pansies are just in flower and will continue to flower all summer. Turbo pansies are ideal for containers, tubs, flower borders and for filling gaps amongst other plants. For colour now and sweet scent look out for the beautiful summer flowering lilies. The flower buds are now ready to burst into colour. Lilies can be used in containers or simply left indoors to open into bloom and add colour and scent to your home. For long lasting summer colour for borders try some of the beautiful garden mums. They produce lovely double flowers now and again in mid and late summer. Garden mums are ideal for filling gaps or adding addition colour to shrub beds or flower borders and will reward you with lots of great colour. Plant garden mums now – you wont regret it. Take my advice and plant some flowering shrubs to add colour in existing borders or to fill gaps. One of the best flowering plants for the next couple of weeks are the lovely Spiraea Arguta or bridal wreath it produces masses of white flowers and is a hardy and easy plant to grow. A lovely plant at the moment is the free flowering Cytissus Racemosa this plant is just coming into flower. The bright rich yellow flowers are produced on mass on a compact plant. Cytussus racemosa is ideal for banks or slopes or for ground cover. Beautiful free flowering border plant. A hardy evergreen free flowering shrub is one called Viburnum eve price – this evergreen shrub is easy to grow and suits all soil types. At the moment it will reward you with a super show of colour producing masses of white flowers from pink buds – this is a plant ideal for any garden. For something different look for a small tree called X Laburnocytissus. This particular plant produces two types of flowers one a rich yellow and the other a rich pink. It’s different and really stands out in any garden. It will make a small to medium sized tree suitable for most gardens. The National Spring Clean Campaign began on Friday 1st April and throughout the month community groups, schools and businesses in Galway will take part in a variety of clean up events in their local area. So far 18 groups have registered in Galway. National Spring Clean is the country’s largest anti litter initiative. Last year over 260,000 people were involved in a monumental 3,200 clean up events. To ensure tat this year’s campaign is an even bigger success, more volunteers in Galway are needed. All groups that register are issued with a free clean-up kitt containing a range of clean-up materials and an information pack containing helpful tips on organising an event. National Spring Clean places a particularly strong emphasis on encouraging people to proactively recycle. To assist this process, each clean-up kitt includes special colour-coded refuse sacks rovided by Repak that can be used to segregate recyclable cans and plastic bottles. Claregalway Cleanup Day will be announced in next issue of Nuacht Chláir and in the parish church newsletter. It is hoped to be as successful as last year when all the community participated. Bags and gloves, etc. will be supplied to each individual and groups taking part in the clean up. Bon voyage (again) and best wishes to Averyl Farrell, Cregboy and Fidelma Roche, Knockdoemore, who are off to Saudi Arabia for three months on a locum nursing contract. Best of luck to Paul Greaney of Claregalway Centra who has taken up position as Manager of Claremorris Centra. A popular man – he will be missed by us all! Welcome our new Manager Morgan Hennelly to Centra. Best of luck Morgan in your new post. Claregalway National School will be celebrating its 75th anniversary on the 11th and 12th June. Further details in next issue of Nuacht Chlair. Congratulations to Rachel Farrell, Cregboy who won U12 and Liam Brennan, Kiniska who won the runners-up in U12 Badminton representing Connaught in Dublin recently. Best of luck to Stephanie Newell (formerly of RC Hairdressers, Hughes Supermarket), who is taking up a new post as hairdresser in Rathoath, Co. Meath. Johnny Quinn, Cregboy, 17th March 2005. It’s not just around your eyes that the first signs of ageing show – your neck is just as much at risk. So don’t neglect your neck. When you cleanse your face of daily grime and make-up don’t forget to cleanse your neck, use an exfoliating cream to stimulate circulation and slough off dead skin cells. If the skin on your neck is at all sensitive you will probably only need to exfoliate on a weekly basis. Use a deep-cleansing face mask over face and neck about once a week. Don’t forget to remove all traces of the cleansing mask with a mild astringent (toner). The skin on your neck has only a few fat cells so it has difficulty retaining moisture. Use a rich, nourishing cream to keep the skin smoth and prevent it drying out. There are special neck creams available, but a good all-purpose moisturiser works just as well. Use clean finger tips to spread the moisturising cream from the base of the neck upwards towards the chin with firm movements until the last traces have been absorbed into the skin. Good luck to the three girls who will represent the area in the County Finals of the talent competition on April 12th. They are Aleisha Kelly, Lackagh who will perform in the Solo Dance and Solo Music competitions, Caroline Giles, Kiniska who will compete in the Solo singing competition and Áine Kelly, Lackagh who will play the concertina and tin whistle in the Solo Music competition and also compete in the Recitation. Four teams have been selected to represent the area in the upcoming County Cross Country Finals on 10th April. They are: U12 Girls – Amy Rohan, Nicola Conlan, Sinéad Harte, Aislinn Newell, Georgina Healy, Felicia McHugh; U12 Boys – Richard Commins, Seán Moran, Evan McGuire, Eoghan O’Hagan, John Evans, Michael Coyle. U13 Mixed – Lorcan McHugh,Stephen Walsh,Paul Fahy,Leona McGuire, Lauren Murray; U14 Boys – Darren Martyn, Mark Walsh, Stephen Connolly, Ciarán Harte, Seán Diskin. Sarah Connolly will compete in the U16 girls 6K marathon. Best of luck to all our young athletes who will continue to train under the capable direction of Pauline Harrington. Training for the summer athletics program and the annual sports day for children aged 5-15 will take place soon. Details will be published when available. Our annual quiz took place on March 15th. Well done to all who took part and congratulations to the winners : 1st Marc Higgins, 2 nd Darren Martyn and joint 3rd Pat Loughnane and Liam McGuire. The county final will take place on 9th April and we will be sending 3 teams to represent the area. Good luck to all. Other individual events coming up are: Gymnastics (U8,10,12,14,16) and Judo(U16 – various weight categories) Team Events are: Rounders (U13), Handball(U13, U16), TableTennis(Under 13), Hardcourt Tennis(U13, U16), Pitch and Putt(U16). There are no plans at present to hold local competitions for these events. However, if anyone in the area is interested in participating in any of the above, please contact Christine Moran (798956) for more information. Note that children must be under the relevant age on 31st July, 2005 to participate in an age group. It is now well recognised in research that physical activity is important throughout the lifecycle. Whether you are eight or 80, male or female, exercise is good for you. In the case of children, did you know that physically active children have fewer chronic health problems than kids who are inactive? Children who develop good exercise habits early in life are more likely to be active as adults. Active children and adults have a much lesser risk of developing heart disease and problems that contribute to this. Children who are active are better able to meet the demands of daily living – they socialie better, generally do better at school, feel better about themselves and have more self-confidence. So why is it that by the time they reach secondary school less than half of teenagers take part in regular physical activity? In Ireland we now have one of the highest standards of living in the western world. We enjoy much better lifestyles now than our grandparents did. And yet are we killing ourselves with kindness? Are we giving our kids a lifestyle that is going to negatively affect their health in the end? Our kids watch an average of four hours of television per day. Unfortunately our modern lifestyles contribute a great deal to keeping our kids inactive. In many cases roads are no longer safe for our kids to walk to and from school, while kids playing freely in parks seems to have become a thing of the past. Time constraints, with both parents working, leaves little time for anything else. It’s all about LIFESTYLE. There’s no point in having your child at soccer training for an hour on a Saturday morning and then letting him/her sit in front of the TV for the rest of the day and eat crisps and chocolate! Get the right balance – lots of activity, healthy eating, monitored TV/video game time, balanced study/homework and last but not least – rest and sleep. How much exercise do kids need as part of a healthy lifestyle? The British Health Education Authority and many other informed bodies in this area advise that children should experience an average minimum of one hour or physical per day. This may not necessarily happen in one session but could be accumulated throughout one day. Introduce your kids to activity that’s fun. Once you get your kids moving in the direction of active living, chances are they’ll stay active for the rest of their lives. Make sure that you concentrate on the positive aspects of exercise. Avoid too much competition and embarrassment. Praise them for doing. Set time aside for healthy meals at home; plan healthy school snacks and lunches. Limit TV and video games – Be firm. Believe it or not kids like structure in their lives just as much as adults do. Have your say in schools – support teachers in developing new campaigns. Support sport – but remember that developing the ‘habit’ of healthy exercise is far more important than winning the game – praise effort as well as performance. We all have a role to play in keeping kids active. Maura O’Sullian Ryan, B.A. (Phys. Ed), M.Ed. (Phys. ED), NCEFT, is Director of the National Certificate & Fitness, Ireland’s largest and longest established health/fitness instructor training programme. As part of our season of introducing the ethos of the Educate Together education system to those who are interested in the Claregalway community, we are delighted to present an article written by Terri Claffey the Deputy Principal, and also a parent of the Galway Educate Together National School. She was an active participant during the set-up years in the portacabins and is now reaping the benefits of the magnificent, purpose built building. Practically a world apart from the initial years, but, as she presents: community, education and the opportunity for positive messages to give our children come in many gloriously unexpected ways. Terri has titled her words: “A Leap Of Faith”. These words are ones that we would echo for our own experience of setting up the Claregalway Educate Together School. This is both in terms of the committee having to take one step at a time whilst wading through the enormous process of setting up a healthy and fully functional school that adheres to the strict guidelines as set out by the Department of Education. The words also echo our invitation to all parents who may be interested in finding more about our ethos and approach: Pick up the phone! Enquire. Ask Questions. Make an informed choice about your children’s education! We really do encourage you if you are interested, as once these schools are up and running, the experience (without exception) is that they become heavily over subscribed with long waiting lists. We would anticipate this to be the case with the Claregalway school. We are a committee of passionate parents seeking choice for our children’s education. Please do make contact, you can start, as your first port of call, with: Emily Belfrage: 091 797 644. We look forward to hearing from you. In the meantime we leave you with Terri’s words. September 1st 1998 I walked into a bare, dusty, ugly prefab. The staff were meeting to get to know each other and to arrange the classrooms for the next day with the children. I was impressed by the professionalism of the staff and I spent a tough day making a little haven out of a bare grey room. I spent three years in this building and I saw parents put their lives on hold as they worked to get a permanent building and in the meantime make the best of this prefab. Parents came in at weekends to paint walls with paint scrounged from paint shops. This led to very unusual colour schemes but certainly took the greyness away and added to the atmosphere. I witnessed parents collect the towels every day and return pristine clean towels the next day without fail. I saw photocopiers,washing machines,microwaves,encyclopedias etc donated. I had experienced parental involvement before but never to this extent. As I got to know the school community I saw a very committed group of people. The pride and energy was amazing. I boasted to family and friends about our school. I had come home. First name terms, pupil directed learning, circle time and workshops by parents were par for the course here: ideas I had been promoting for years in other schools. Recently as I commiserated with parents and students of Galway Educate Together who spent their entire school career in temporary accommodation and never experienced the new building, I realised they had experienced the essence of the ethos. Yes they missed out on the P.E. hall, the shiny, bright corridors and the beautiful new library, but they certainly had that something else. They were assertive and creative. They were motivated and enthusiastic. Happy children are children ready to learn. It was pointed out at a recent North Galway Educate Together meeting that Educate Together do not have the monopoly on happy children. I certainly agree. But the sector does have a multi-cultural vision. Difference is not just accepted it is celebrated. Inclusivity and tolerance is promoted. All religions and none are welcomed. At no point as a parent was I ever asked if we were religious. It was not mentioned on the enrolment form. This is what the sector has a monopoly on, and Educate Together schools can hold their heads high when it comes to preparing students for a multi-cultured society; whilst still given the opportunity to celebrate their own religion. Why did people protest at the opening of the Dalkey School Project in the seventies? (See footage of this on the Educate Together website- www.educatetogether.ie) Educate Together was seen as a threat. As society becomes more progressive the multi-cultural aspect is no longer the greatest threat. The fact that an Educate Together school has to open in temporary accommodation is now the biggest threat. Unfortunately parents have to buy into a school that doesn’t exist and as a parent myself I can see that this is difficult. Why inflict a temporary building on any child? Surely the building should be there first. Yes in an ideal world, but that is not how the Department of Education works. Yes we want the best for our children but what is highest on the priority list: values or facilities? I have seen true education take place in a room of sixty students with one book between three and the fans not working in Singa in the Sudan. I have held an impromptu lesson on responsibilities that go hand in hand with rights on a piece of carpet with 17 very disenchanted students in Tottenham.I learned a lot on both occasions. What do I want as a parent for my children? Happiness, challenge, acceptance: regardless of whether they have a religion or not, acceptance regardless of whether they are athletic or not, academic excellence and social acceptance. Many have similar aspirations. I also want more, being both a teacher and a parent. I want independent learners, children who value teamwork, children who are assertive but not cheeky and children who analyse and criticise. Can any school live up to these expectations? A school is only as good as its team and this is true of all schools. Given the interest that pupils, parents and staff have in an Educate Together school there’s an advantage before you begin. You as parents will have the most influence on your children. If the school you choose promotes your views and values how wonderful! Attitude is a word we are familiar with when talking about our young adults. If the attitude is one of pride and participation then success is more likely. If as parents, children and staff we take pride in our “little global village” then we are more than half way there. I wish the team in North Galway every success as they embark on this journey. Its a matter of choice….and a leap of faith! Loughgeorge Golf Society held their first outing of the 2005 season in a sun-drenched Athenry Golf Club on Saturday Mar 19th. A turnout of close to 70, combined with plus 20oC temperatures, certainly seemed to heat up the scoring with no fewer than 5 players breaking (some by quite a bit) the magical 40 point barrier. Congrats to all the winners (and their fantastic scores). Thanks to our Sponsors for the Day (Fexco Group) and to everyone else for taking part. Bawnmore National School held their annual table quiz recently in the Turloughmore Community Center with an excellent turnout of over 40 tables. It was a very enjoyable night for all involved and a very successful undertaking in raising significant and much needed funding for the School. The organising committee would like to thank all involved, in particular our many sponsors, everyone who collected and donated spot prizes, our Quiz master Michael Monaghan, the Turloughmore Centre Committee and all who helped to make the night such a resounding success. The winners on the night (after a close fought battle) were Martin Murphy, Mary Kelly, Shane Kelly and Robert Kelly with the first prize in the Student competition going to James Corcoran, Richard Hession, Patrick Cullen, and John Kilgarriff. Congrats to them all and and thanks again to everyone else for taking part … after all it’s the participation and not the winning that counts … especially when it’s in aid of such a good cause.